A budget sling backpack "packed" with extra features such as a cell phone pocket attached to a soft, comfortable padded strap. Wider than our competitors, this fits a lot of stuff! 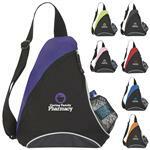 Back to school promotions, fundraising item, emergency backpack great for the on the go family trip. 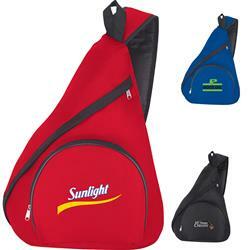 This is one of our more popular sling backpack models. Available Colors: Blue, gray, red and black. 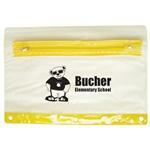 Available Imprint Options: Screen or embroidery.